Crowdsourcing from the community is in and how. Kingfisher Premium, the flagship brand from The United Breweries Group has come up with a specially designed font called Kinglish that has been crowdsourced from beer lovers across the pub city of Bangalore. 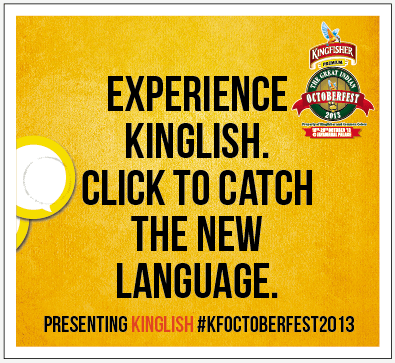 Kinglish has now been designated as the official font of the Kingfisher Premium – The Great Indian Octoberfest 2013! As a build up to the recently concluded 9th edition of Kingfisher Premium – The Great Indian Octoberfest 2013, the beer brand’s biggest fest of music and beer reflecting the spirit of the German Oktoberfest, Kingfisher saw an opportunity to create something unique by the community, for the community. It decided to crowdsource a whole new font that would define its communication. Armed with curious posters, blotting coasters, mugs and pitchers, Kingfisher hit the most happening watering holes in the pub city of Bangalore and challenged the young and the restless to spill some beer and spell a whole new language. Across two busy weeks and busier weekends, while pub hopping across watering holes, a whole new font was made entirely by crowdsourced beer mug and beer can impressions from thousands of party animals. Beer by beer, stain after stain, letter by letter saw the emergence of a new language induced by beer. It was then taken to the design studio. Hundreds of expressions for each letter were examined, instagramed, tweeted, shared, and curved until the perfect alphabet screamed ‘beer’ from every angle. And Kinglish came into existence! This is perhaps the first for any brand to introduce its very own crowdsourced font from the target community itself and make it their official language. With the introduction of Kinglish, Kingfisher the social savvy beer brand as always, has further strengthened its engagement with the community and gifted them something which they can uniquely own. Crowdsourcing and co-creating with the community is surely going to go a long way in the country. Does Android violate Oracle’s copyright?